More goodness out of Googleplex. Today, Google is rolling out a new tool called “Art Project,” which gives you access to more than 1,000 works of art appearing in 17 great museums across the world. Using Google’s Street View technology, you can now tour collections at the MoMA and Met in New York City, the Uffizi Gallery in Florence, the Hermitage in St. Petersburg, the Van Gogh Museum and Rijksmuseum in Amsterdam, the National Gallery in London – just to name a few museums now virtually open to you. And you can visit countless paintings, some rendered in super high resolution. (We’re talking 7 billion pixels!) Take for example, Vermeer’s Officer and Laughing Girl (see above) or Van Gogh’s The Bedroom. 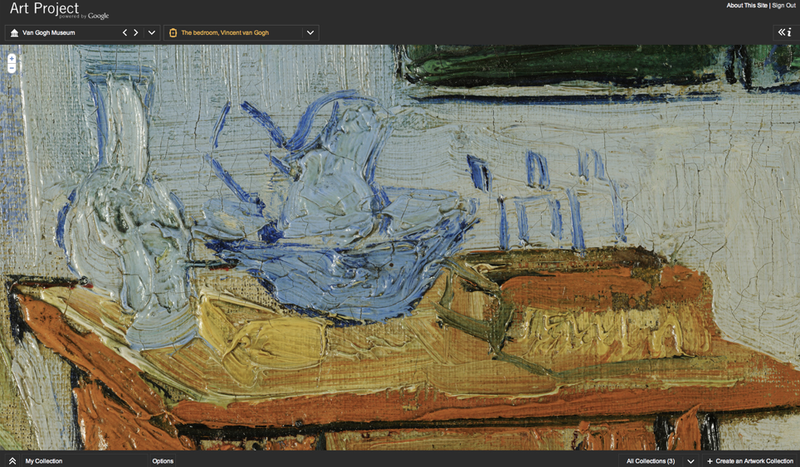 When you view Van Gogh’s painting, make sure you zoom in and look at the brushwork. Although you won’t have access to the entirety of every museum (actually the selections are rather limited in many cases), Google’s Art Project does put 385 rooms on display. Not a bad start.